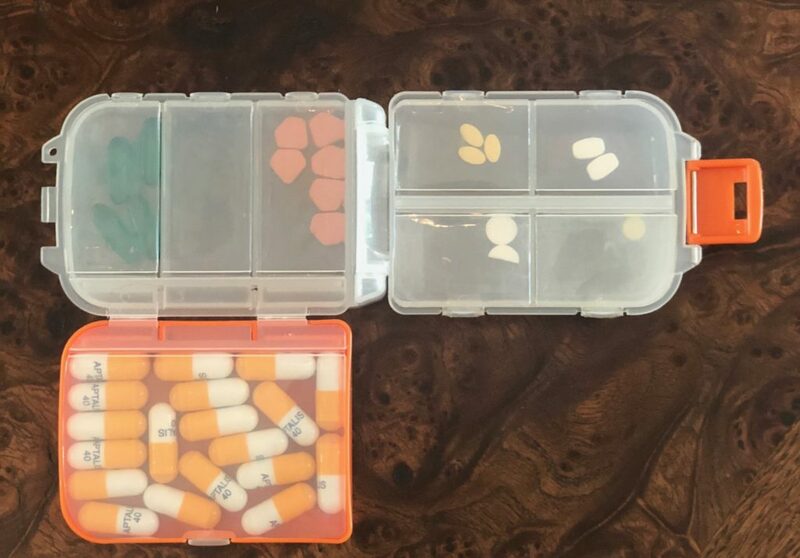 Monday Morning Thoughts: How I Organize My Pill Case, Favorite Summer Activities, and Support BEF on Amazon Prime Day. It’s Amazon Prime Day! It’s also a Monday… so let’s jump into it! First, why do I use a daily sorter instead of a weekly one? Well… it was just the one that I happened to get my hands on when I was in high school, and I’ve stuck with it ever since. I used to use ziplock bags, but that method proves to be wasteful and costly. I load up my pill case with what I need on a daily basis. Enzymes take up the bulk of the space. Beyond the pancreatic medication, the case is a mix of prescription medications and over the counter remedies. On the left side of the case (the vertical containers) I store Advil/Aleve (far left), in the middle I reserve an open space (for periodic prescribed medication – antibiotic, etc. ), and finally I store Zantac (far right). Aside from my enzymes I reach for NSAID’s and acid reflux meds more than anything else. On the right side of the case, I store medications that I may need for a trip or for when I know I won’t be around my bottles. I’m less likely to utilize the right side of the case day-to-day. As you can see, it’s been a couple weeks since I’ve been on a trip, so I haven’t had a need to reload it. Top left we can see my prescribed nausea medicine (nausea is like my kryptonite and Zofran is God’s gift to people like me). I use those meds somewhat rarely, but I like to have them for the odd moment when I need them. Moving clockwise, I have my allergy medication (mainly for allergy season). Below the allergy meds, you’ll see my vitamin K that I use when I have small lung bleeds. That compartment is especially full if I’m going to be away for a few days. To the left I have 10mg prednisone pills. I break them in half for my daily 5mg dose when I’m not near my pill bottle. Ultimately my pill case is capable of fulfilling my daily needs, as well as short-term travel needs. My daily routine encompasses reloading my pill case after I take my morning medications (directly from the pill bottles). Finally, I like to have my hands on my pill bottles each and every day so I can take daily inventory leading up to refills. Much of my free time during summer days revolves around improving my quality of life. I love losing myself in a book, spending time with my friends and family (a good bonfire really gets me going), and creating memories that help shape my personality. Oddly enough, playing hockey is one of my favorite summer activities as well. I skate once or twice a week through out most of the warmer months. It’s awesome exercise that compliments my gym sessions and quick runs. Summer is a time to reset, and I value my time now more so than at any other point during the year. I don’t really love how fast time moves in New York, and for that reason, I think it’s important to slow down wherever possible and gear up for the explosive 9 months following Labor Day. Blink enjoys summer reading about as much as I did when I was her age.